Next time you go shopping for a second television set for the spare room or bedroom, chances are it might be one of a new breed of smaller full high-definition TVs, such as the new models introduced today by Sharp. The latest Aquos LCDs from the Japanese company will go on sale at the end of November and include the world’s smallest full HD TV, which has a diagonal screen measurement of just 22in; far smaller than the 40in-plus displays common in the HD marketplace now. Two other sets – 26 and 32in models – were also announced, with all three of the 1920 x 1080 TVs sporting dual HDMI ports and capable of displaying full 1080p video. Aside from size, the main difference between the sets is the contrast ratio dropping from 2,000:1 on the 32-inch model to 1,200:1 on the smallest Aquos. 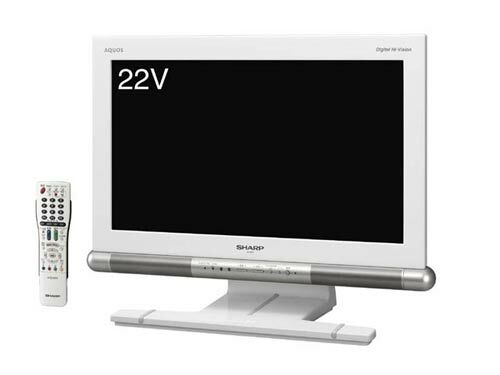 Sharp has also made all three televisions suitable for hooking up to a PC by including a range of analog and digital connectors and a keyboard-stowage area on the base of the stand. Although the prices - ¥180,000 ($1,540) for the 22in, ¥200,000 ($1,700) for the 26in and ¥240,000 ($2,050) for the 32in – are still in the realm of what most people would spend for a main TV set, competition in the small HD TV market is sure to drive them down quickly and hasten the high-definition spread.